For security reasons, your E-Gift Card number and PIN are delivered in two separate emails. Please refer to your E-Gift Card confirmation emails for this information. Gift Cards are redeemable solely for purchases in the U.S. and Canada at Patagonia, Inc. or Great Pacific Iron Works stores, Patagonia.com, or Patagonia Mail Order. Lost, stolen or damaged Gift Cards will not be canceled and replaced without the required proof of purchase. Contact your local Patagonia store or 1-800-638-6464 for details. Recipients of Gift Cards who wish to shop online and ship product to Canada, must shop on the Canadian site. No purchases made on the U.S. site will be shipped to Canada. Gift Cards are not redeemable for cash. If the value of your Gift Card is greater than the amount of your total purchase, you will be able to use the remaining Gift Card balance for future purchases, subject to these terms and conditions. If the value of your Gift Card is less than the amount of your total Patagonia.com or Patagonia Mail Order purchase, you must use a credit card in order to complete your purchase. If the value of your Gift Card is less than the amount of your total Patagonia retail store purchase, you must provide an additional payment method accepted in that retail store in order to complete your purchase. Purchase or use of any Patagonia Gift Card means you accept these terms and conditions. Any term of this Gift Card purchase agreement deemed unenforceable shall be severable and the remaining terms enforced. California law shall govern the Gift Card program, without regard to principles of conflicts of law and as if this Gift Card purchase agreement were a contract wholly entered into and wholly performed within the United States, in the State of California. Any dispute arising from or relating to the Gift Card program shall be submitted to confidential arbitration in Ventura, California. Arbitration shall be conducted under the rules then prevailing of the American Arbitration Association. The arbitrator’s award shall be binding and may be entered as a judgment in any court of competent jurisdiction. To the fullest extent permitted by applicable law, no arbitration under this Gift Card purchase agreement shall be joined to an arbitration involving any other party subject to this Gift Card purchase agreement, whether through class arbitration proceedings or otherwise. Gift Cards are mailed individually, via complimentary US Postal Service First-Class Mail. More information about expediting the delivery of your Gift Card(s) is available at checkout. No special offers may be applied to the purchase of a Gift Card. This is a merchandise return credit. Merchandise return credits issued by Patagonia, Inc. are redeemable solely for purchases in the U.S. and Canada* at Patagonia-owned stores, patagonia.com, wornwear.patagonia.com or Patagonia Mail Order. Lost, stolen, used or damaged cards will not be canceled or replaced. Merchandise return credits cannot be used to purchase gift cards, merchandise return credits, or Worn Wear merchandise cards. Contact your local store or 800-638-6464 for details. Card not redeemable for cash except where required by law. No resale. Use of card constitutes acceptance of terms. Card terms and conditions are subject to change without notice, and some items may not be available. Any term of this card program deemed unenforceable shall be severable and the remaining terms enforced. California law shall govern cards issued or used in the U.S.; Ontario law shall govern cards issued or used in Canada. Void where prohibited or restricted by law. 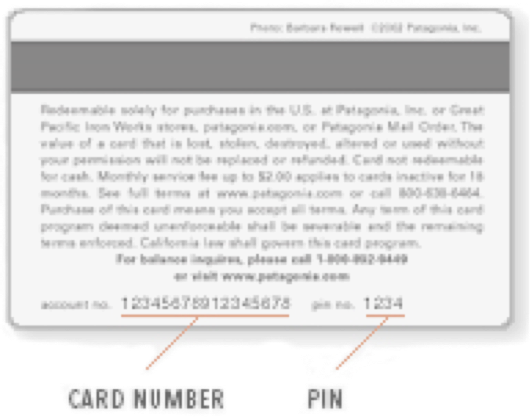 Merchandise Cards issued by Patagonia, Inc. are redeemable solely for purchases in the U.S. and Canada at Patagonia, Inc. or Great Pacific Iron Works stores, patagonia.com, wornwear.patagonia.com or Patagonia Mail Order. Lost, stolen, used or damaged cards will not be canceled or replaced. Contact your local store or 800-638-6464 for details. Card not redeemable for cash except where required by law. No resale. Use of card constitutes acceptance of terms. Card terms and conditions are subject to change without notice and some items may not be available. Any term of this card program deemed unenforceable shall be severable and the remaining terms enforced. California law shall govern this Card Program. Void where prohibited or restricted by law.